Large selection of high quality food, treats, toys, accessories, supplements & cages for your budgie. Find everything you need to keep your budgie, healthy, stimulated & great looking. From top quality food, healthy treats, fantastic toys to wide selection of cages and accessories. Same day dispatch & Free shipping on orders over £39! Pet Budgie? Look no further. We have all you need for your Budgie friend. 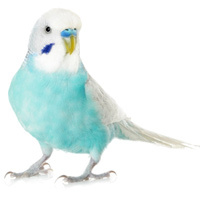 Your Budgerigar or “Budgie” needs the right food and nutritious diet met daily. We have a wide selection of high quality seeds, pelleted diets, and complete foods to help you meet your Budgie’s needs. We also offer foods with scientifically formulated mixes that can be used for birds that are weaning, breeding, or ill. In addition to our foods, we have treats made of fruit, veggies, nuts, and rice that are perfect for spoiling your Budgie and a great motivator for teaching him new tricks. Don’t forget about our one of a kind line of budgie supplements made especially for your special budgie. Whether you’re needing iodine blocks, palm oil supplements, and/or powdered vitamin and mineral supplements, we have the perfect selection for keeping your budgie healthy and fit. In addition to food, treats, and supplements, we also carry hygienic products. When thinking about your Budgie’s active life, consider our great selection of toys. Your companion can stay entertained outside or insider their cage with chewing toys, ladders, climbing frames, and more! When your Budgie spends time outside of his cage, having a stand for them is perfect to keep them active and stimulated. Check out our selection of stands, gyms, nail trimming and window perches. Keeping your Budgie mentally stimulated is easy to do when you have a big cage for all your feathered friends’ toys and accessories. Each cage we offer is made from the finest and most durable materials that are designed to provide your beloved pets a secure and stylish home. When you invest in one of our many cages to accommodate your Budgie, you’re giving your beloved Budgie the perfect place to lounge. When you need to take your Budgerigar on trips with you, we have travel cages to get your Budgie to the destination, safe and sound.